I wrote a lot this past year about what EDH can do to prices. With 2015 winding down, I’m looking back at what I’ve written so far and thinking about the series as a whole. We’ve talked a lot about the effect new printings can have on prices, but there are a few nuances I want to really solidify so we can head into 2016 swinging. It’s a pretty simple thesis, and I think I’ve made a pretty good case for it. Not even that—it makes a good case for itself. It doesn’t take a ton of detective work to look at Teferi’s Puzzle Box, Winds of Change, Forced Fruition, Wheel and Deal, and Wheel of Fortune all spiking the same week, just after the Mind Seize deck with Nekusar, the Mindrazer came out, to figure out those things were related. Nekusar came along and the card launched an entire deck archetype. It’s a very annoying one, but it’s a very good one. It’s easy and obvious to build, and it’s effective, popular, and everyone who had access to the precon had access to it. With financiers buying up every copy of Mind Seize they could get their mitts on to flip the copies of True-Name Nemesis, some people had an opportunity to get the rest of the cards for fairly cheap after the financiers culled the copies of Nemesis and Baleful Strix. 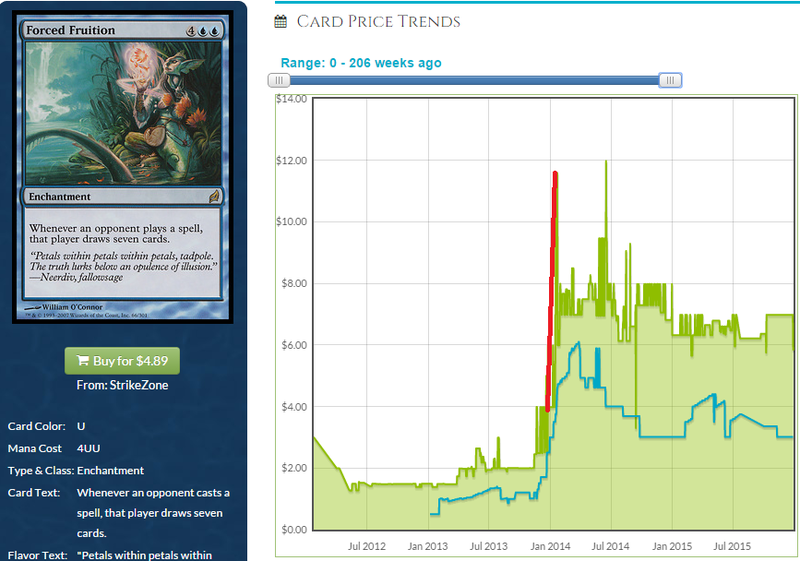 These cards saw their prices affected to a huge extent and the spikes all occuring at the same time, a few weeks after the set was released and people began building with Nekusar and figuring out wheel effects were the gas that made the deck work, prices spiked accordingly. That’s something I feel like I haven’t covered as well. It’s important to understand the limitations of this effect. EDH has a broad appeal, and that appeal is growing, but that doesn’t mean we aren’t limited in the effect new cards can have on prices of other cards. 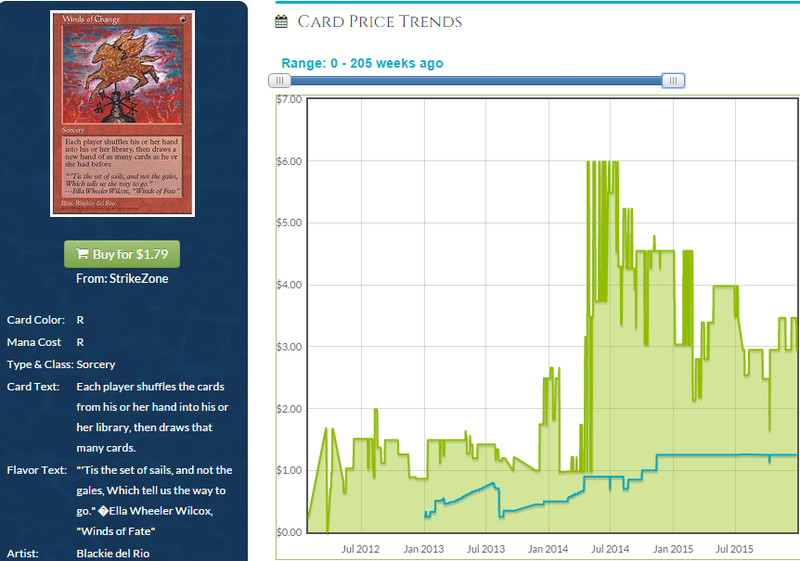 The more copies of a card there are, the more the deck will need to be played to affect the price at all. While Nekusar was able to move older cards like Puzzle Box and even a recent-ish card like Forced Fruition, cards that everyone has lying around, let’s re-examine some of these graphs and talk a bit about what happened with the cards’ prices. This is the price of Forced Fruition over the last 3 years. The arrow points to the point where people started to realize this card was nuts in Nekusar decks. This was a $2ish card—not selling briskly on TCGplayer or eBay or Cardshark, but not shipped in bulk, either. A $2 card isn’t worth putting in a store display case. It’s not worth having in a binder, because it’s too old for anyone to care and not valuable enough for anyone to be after. This card was total trash to all but the casualiest of casuals until it was suddenly the perfect card for a deck that just popped into existence. What happens when something like that occurs is a weird process. First, the internet gets bought out very quickly, causing a very sharp price increase as the cheap copies are bought out and the people hoping to cash in post their copies for as much as they think they can get. Then, people start to dig the cards out of boxes and the supply begins to catch up as copies come out of the woodwork. Organic demand takes over and people start to realize they don’t mind paying more than they used to be able to for the card because it’s quite good in the deck, but slowly, increased supply catches up and satisfies the demand. Finally, the race to the bottom begins and the copies sell at a slower rate and prices plateau. The price ends up higher than it was before, lower than its peak, and at a place where people are comfortable both buying and selling. The price has a tendency to equilibrate here. But this is pretty unique to cards that are spread out and not concentrated in the hands of dealers. What would happen if Wizards printed another card like Nekusar, and people who had Nekusar decks built already decided they wanted a second copy of Forced Fruition? Well, we’d see the price basically track to its new equilibrium point. It would fluctuate a bit, overcorrecting at first, but not as drastically. The copies are concentrated in the hands of dealers who paid a fair price for Forced Fruition and overpaid a bit when the price was beginning to equilibrate as supply caught up to demand. Those dealers who overpaid aren’t in a hurry to sell at a small gain, so they are hanging onto their copies and selling one at a rate of one per new Nekusar deck. That’s a slow rate. That rate would increase if there were a new Nekusar, possibly in different colors and people built the new deck as an addition instead of taking the old one apart. When there are a lot of copies out there in the hands of dealers, the prices don’t go quite as nuts. We are seeing a high percentage of copies of Forced Fruition out of collections, shoe boxes, rubber bands, and dollar boxes, because when the card initially spiked, everyone and their cousin hit their LGS and their closets and binders looking for copies of the card to ship into the frenzy. This effect is going to be attenuated greatly for a newer card. How do I know? Let’s look at a card that’s played in a much greater percentage of Nekusar decks. This is a card that, according to EDHREC, 61 percent of Nekusar decks play compared to the 49 percent (can that be right?) that play Forced Fruition. There was some initial hype surrounding Whispering Madness when people tried to couple it with unblockable creatures in an attempt to mill opponents to death. Casuals are always going to try to play Dimir mill; they just are. When this card proved that it couldn’t carry a whole archetype on its back and the supply began to overwhelm the dwindling demand, the price suffered. Want to see something really interesting? 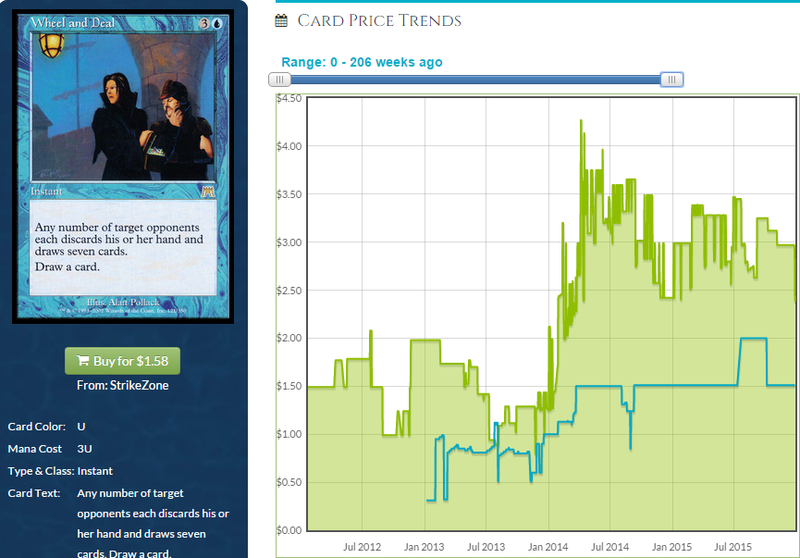 Let’s look at what the graph did when Mind Seize was released. That little dip may or may not have been caused by the Nekusar frenzy. There’s not much of a mechanism for new demand to cause the price to go down, but if you ignore the dip and just look at the average price since the deck was being built, you’ll see it’s on a decline, on average—pretty similar to the slope of the buylist price. Why would we see such a profound effect for one card and such a different one for another card? The answer seems pretty simple to me: recency. Whispering Madness is in every bulk bin, every binder, every shoe box. 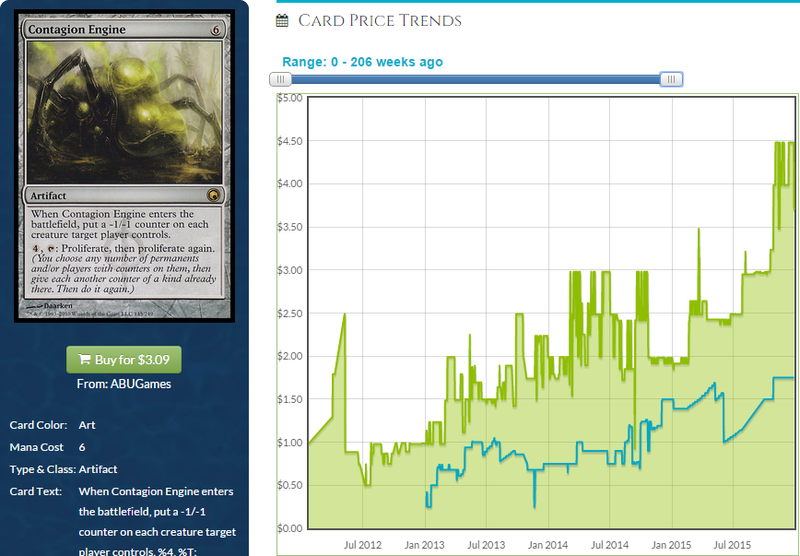 It was less than a year old when the Commander 2013 decks came out, and copies were everywhere. Anyone who wanted a copy of Whispering Madness to jam in their Nekusar deck probably had one already, or had a friend who would give them one for free. It was a bulk rare, and therefore, it was everywhere. The card wasn’t concentrated in the hands of dealers, but dealers still had more copies of Whispering Madness than they likely had of Forced Fruition, despite having a smaller percentage of the total number of the available copies. A new event can clearly move the needle on older cards with relatively fewer copies printed. 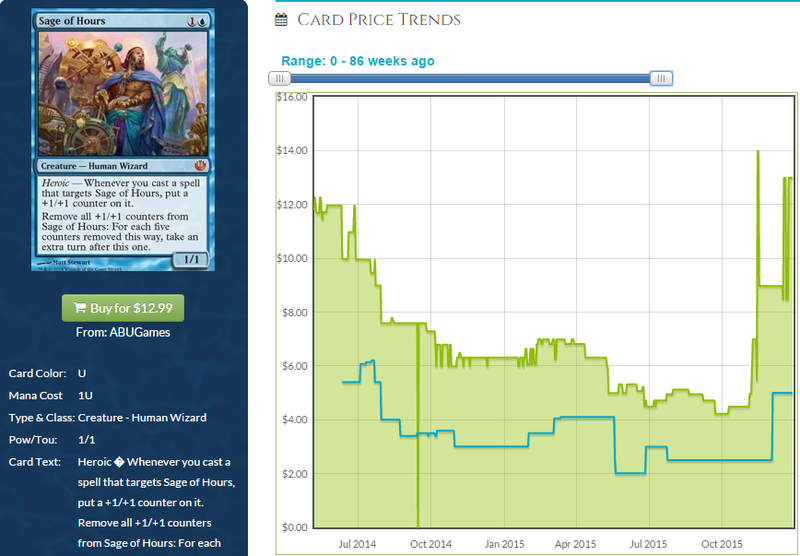 Magic has gotten continually more popular, so the further back you go, the fewer copies of a card there are. With fewer copies of old cards in the hands of dealers and more scattered to the four winds, cards have time to spike in price as people slowly unearth their buried copies and gradually feed them into the machine. 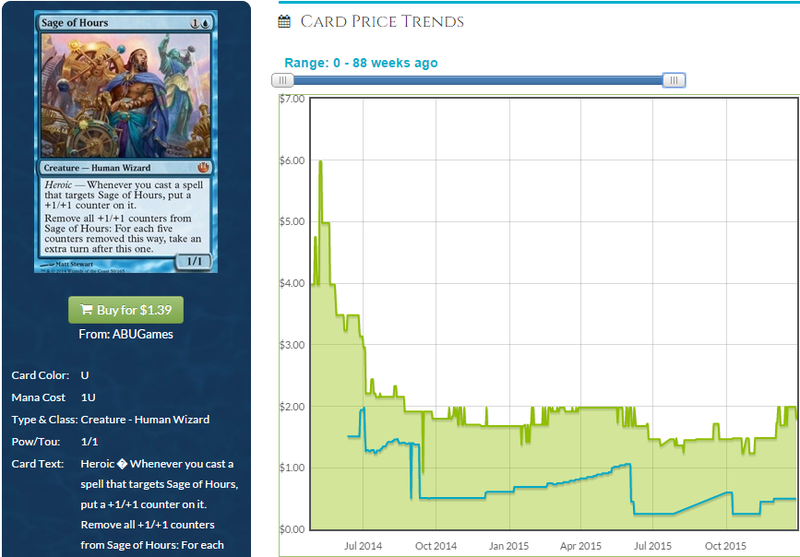 Are there ways we can mitigate this and make some smart buys in more recent cards? They can, and there are a few things we can do if we correctly predict a new card is going to make a new archetype that people will want to play. Sage of Hours is pretty busted with the new Ezuri. Once you get him up to five experience counters, he can dump five +1/+1 counters on your Sage of Hours, allowing you to remove said counters and take an extra turn. If your opponent(s) can’t interrupt this with an instant, you take every turn and kill them with your creatures and win the game. Despite it being a mythic, there are quite a few copies of Sage of Hours out there because it’s recent and not in high demand from Standard players. Most of the copies of this card are just sitting in store inventories, and the new Ezuri deck hasn’t been built enough to move the needle. 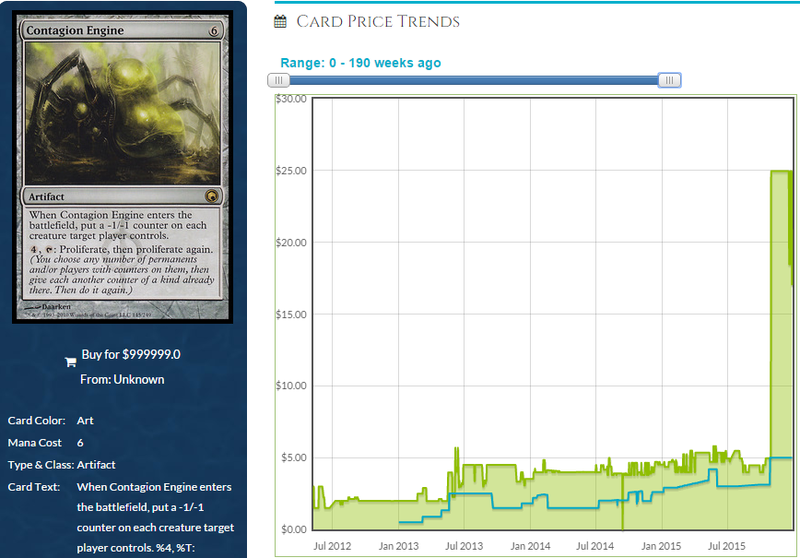 The threat of a reprint is always present, also, and no one seems super willing to gamble on this card. Store inventories haven’t moved much, either. There wasn’t really money to be made predicting this would pair well with Ezuri as soon as he was spoiled. Or was there? This went from a Vorel of the Hull Clade spec to a bit of a bust to an Ezuri staple, in foil. Foil copies are less prone to a reprint, especially in a Commander-series deck which doesn’t have any regular-sized foils. Foil copies have higher upside, since there is usually a multiplier that will drive the two prices apart as the non-foil increases. There are fewer copies of the foil, and for cards that are printed in event decks and such, the set foil is even scarcer compared to the non-foil. 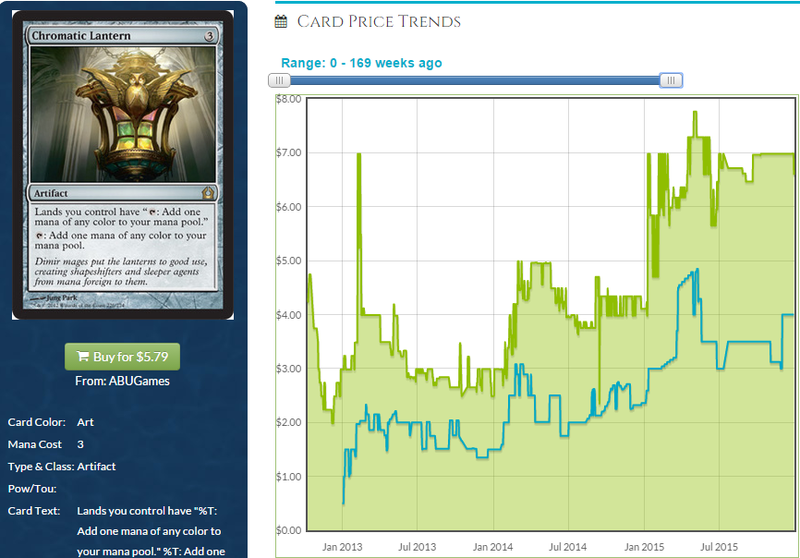 The relatively few numbers of copies make it easier for buying behavior on a small scale to signal the market that the price is moving, and when the card is merely twice as expensive as the non-foil like we saw here during Sage’s lull, you can still buy effectively, getting half as many copies but experiencing four times the upside. Currently sitting pretty around $13, this card could go back down, but with Ezuri’s current popularity (it was the second most-built deck last week according to EDHREC), that may take a while. Moving very nicely up in price for years, Contagion Engine seemed like a good way to proliferate experience counters with the new commanders in Commander 2015. It’s colorless, allowing it to go in any of the five decks, and it serves as removal, something that is important in decks like Simic that lack a ton of ways to kill things without bouncing them or turning them into tokens. 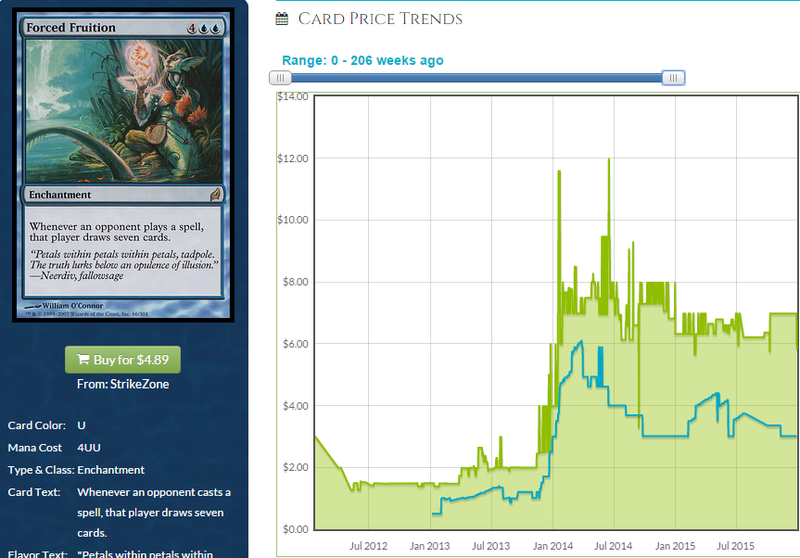 Still, the slope of the graph doesn’t really increase with the printing of Commander 2015. It seemed almost a shoo-in in one or more of the decks, and while it’s getting up there, it’s nowhere near the popularity of a card like Darksteel Plate, a card from the same block whose price is higher than you might think. Was there any money to be made on Engine? 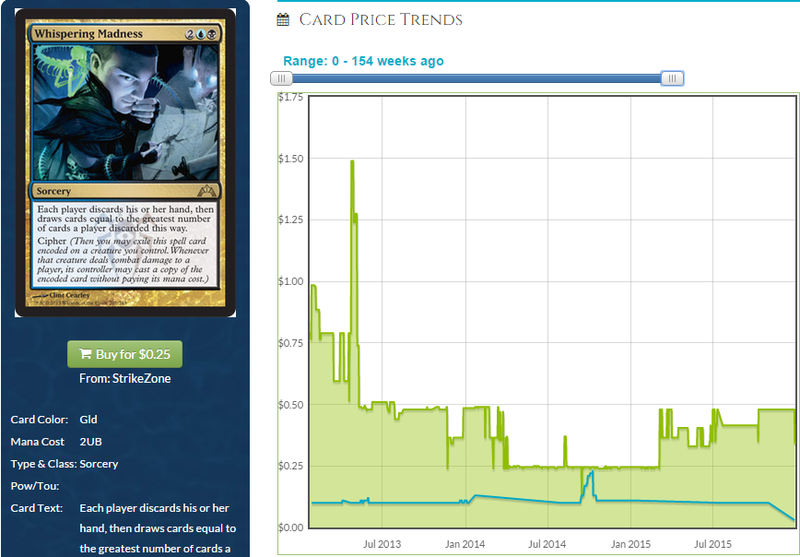 Apparently there was money to be made on the card in foil, where the price tripled overnight, and while it’s returning to equilibrium, it’s equilibrating much higher than the price was before experience counters made us pay attention. I plan to continue identifying upcoming archetypes made possible by new printings as well as identifying staples that don’t necessarily need events to drive the price up. There was no real event other than EDH being a fun format that caused Chromatic Lantern to climb like it has, but every once in a while, the price corrects higher due to adjustments in dealer buying behavior and player buying behavior. This was a card everyone knew was good basically just in EDH, but which no one really talked about. This went up calmly, behind the scenes, and keeps surprising everyone with how high it continues to go. I plan to spend a lot of time talking about event-driven upcoming price increases next year, but I also want to spend some time identifying staples that are going to march solidly up in price and which will be great cards to stock a binder with. Remember, EDH players are who we want to trade with. They want a much larger range of cards from us, and they’re more likely to undervalue (maybe not money-wise, but to just generally care less about) Standard staples and other cards we can instantly sell on TCGplayer, much faster than we can sell EDH cards. I hope you’ll join me next year, where we’ll keep looking at the fascinating world of EDH finance and chart some uncharted territory while we do. See you in 2016. How do EDH players acquire Standard cards in the first place? It seems they would get to a point where they just don’t have anything easy to sell.